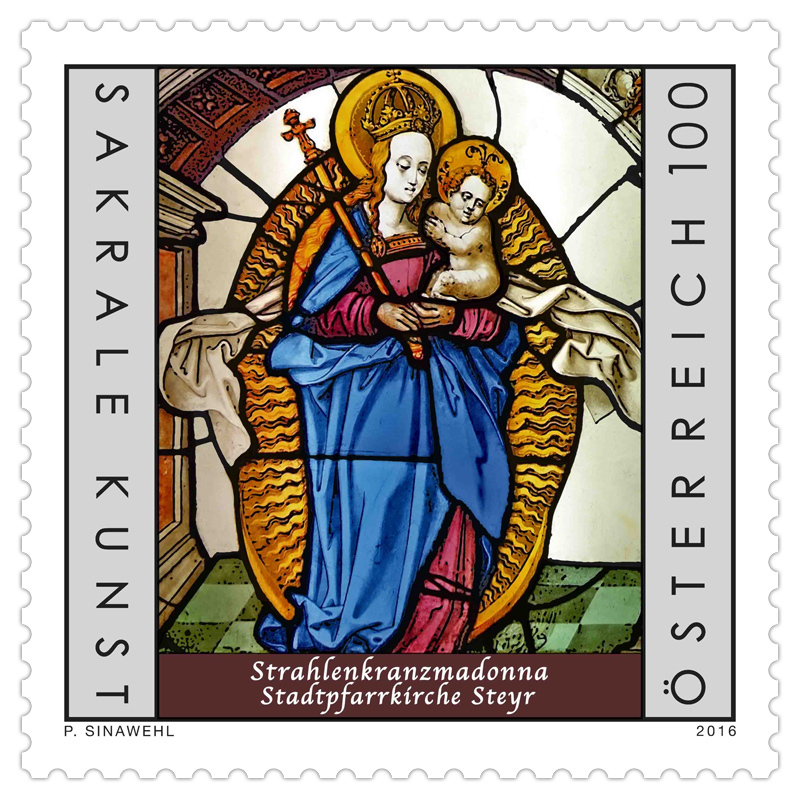 The parish church in the Upper Austrian municipality of Steyr is home to some artistic and historically valuable glass windows. 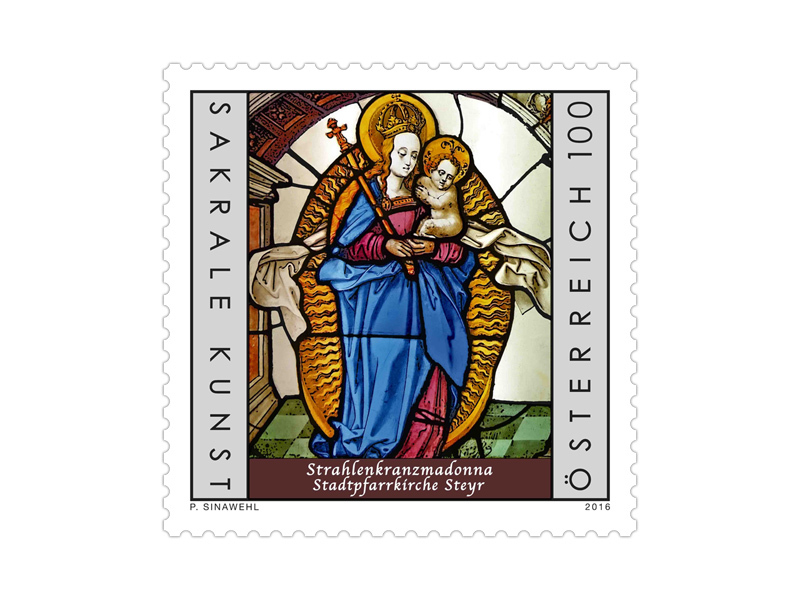 One of the most important of these is the Madonna with halo, which is now being presented by Austrian Post on an engraved stamp in the series “Sacred Art in Austria”. Some of these glass windows date back to the Renaissance era, many of them hail from the 19th century, as is the case for the Neo-Gothic Lamberg window. At the start of the 19th century the parish church of Steyr had to hand some of its stained glass windows panes over to the imperial master builders for use in the Franzensburg castle in Laxenburg. As a compensation, those window panes which were not needed for Laxenburg were subsequently returned, and these panes are now called the Laxenburg window. The stained glass Madonna with halo was among those panes sent to Laxenburg, but was not needed there so, along with other stained glass panels, it was sent to the Schlierbach glass works, where these panes were put into storage and almost forgotten. 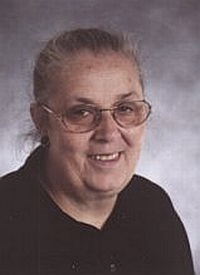 Only as a result of persistent enquiries on the part of the parish housekeeper Amata Grüner (picture), who knew of the existence of the missing Madonna with halo, was the valuable stained glass image finally found. In December 2014 it was returned to the parish church and was allocated its current position in the right-hand side aisle in the window above the gallery. 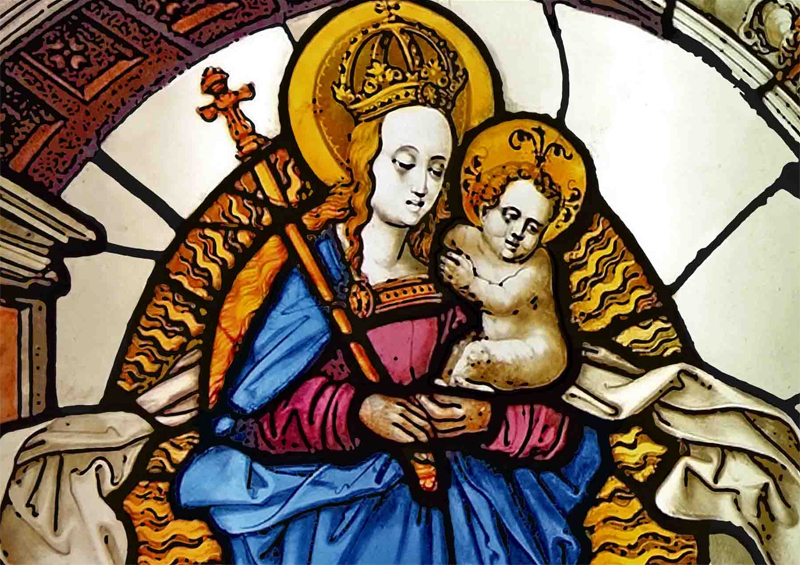 The stained glass image dates from around 1520 and shows the Holy Mother Mary with a sceptre and crown set in a halo of sun’s rays, cradling the Christ child in her arm. The folds and shading make her red robe and blue cloak appear truly three dimensional. The motif of the Mother of God with a halo has been known since the Middle Ages and can be found in manuscripts and illustrations such as those in the Benedictine Abbey of St Lambrecht. This depiction of Mary has its origins in the Book of Revelation, in which Mary is named as the woman whose son will rule and who “was caught up to God and to his throne”. Mary and her child thus became a symbol of hope for the people in times of trouble. The parish church of Steyr that stands today dates from the 15th century and is built in the Gothic style. Hans Puchsbaum, the master builder responsible for St. Stephen’s Cathedral in Vienna, was in charge of the construction. During the 17th century the church was refurbished in the Baroque style to accord with the prevailing tastes at the time. Driven by the monument conservationist of the age, writer Adalbert Stifter, the house of God was remodelled in the Neo-Gothic style starting in 1853, involving the construction of a Neo-Gothic main altar, side altars and a new pulpit and the installation of countless new stained glass windows. In 1885 the tower, which had been destroyed in a fire, was replaced by a Neo-Gothic pointed spire designed by the Viennese master cathedral builder Friedrich von Schmidt. 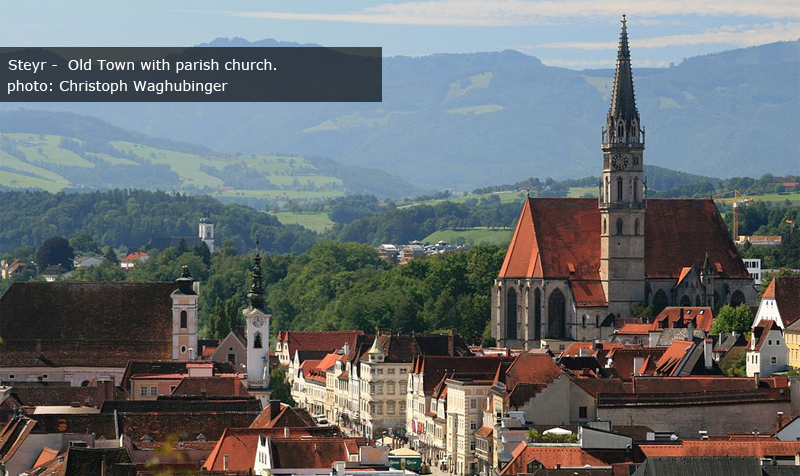 Today the church is the most important sacred building in Steyr and is known for its architecture and its works of art far beyond the borders of Austria.